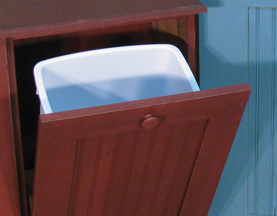 We offer beautiful wooden trash bins, as well as wood trash & recycle bin combos! These items are functional wood storage furniture that looks great in your home! Use one as a wooden dog food bin, or laundry hamper! What a great wood laundry bin! The door tips out, and the top offers extra counter space! Add one of our top cabinets to make this a combination trash bin and display hutch! Check out the different sizes we offer. We also include the trash container for your convenience! With today's environmentally conscious life style, you can not have too many of these handy wooden bins!